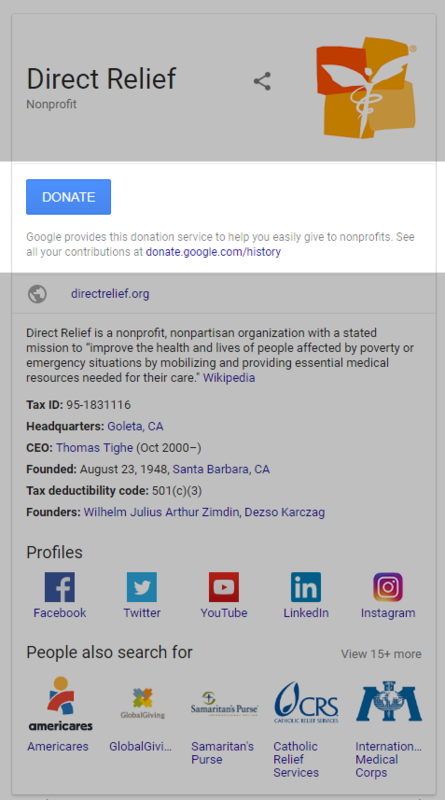 Google has recently released a feature that connects Google users with a nonprofit’s donation page via the knowledge panel (the box that appears on the right-hand side of search results that tells you a business’s phone number or hours of operation). Think about how this can translate to hard numbers for your nonprofit. For most of our nonprofit clients, Google search is their top source of traffic. So, when people are searching for your nonprofit, they can now get to your donation page in just one click. The Google donate button is an easy, free way for nonprofits to boost donations. Clicking the donate button will open a pop-up box that allows users to either write in a donation amount, or click recommended donations of $10, $50, or $250. Then, users can enter their credit card information to complete the transaction. Google ensures that all donations made on their platform is securely transferred to your nonprofit, using a third party donation platform called “Network for Good.” Don’t worry if your nonprofit doesn’t have a Network for Good profile. Network for Good will send a check to your nonprofit’s address on Guidestar. Now for the fine print. Donations are open to all nonprofits in the United States with valid 501(c)(3) status that are members of Google for Nonprofits. All organizations must be registered with the local TechSoup partner in their country and be validated as a nonprofit organization. (TechSoup is an organization that helps Google facilitate software donations for nonprofits, charities, and NGOs.) In order to register for TechSoup, you have to register your NGO. Unfortunately, that means governmental entities or organizations, hospital or health care organizations, and school, academic, or universities are not accepted. To ensure that your nonprofit’s donation check will get to the correct address, make sure your organization is listed in the Guidestar database. Finally, click “enroll” under Google Search and One Today on your Google for Nonprofits account to complete the enrollment. Check out this user-friendly guide on the steps to setting up a Google Donate button for more information on how to get started. Morgan is a strategist who provides clients with clear digital strategy, a logical approach to web design, and expert knowledge in building and improving websites. Her clients include UsAgainstAlzheimer’s, The Cipher Brief, Legal Writing Institute, Hardwood Plywood and Veneer Association, and the International Youth Foundation. She has over a decade of competitive swimming under her belt (swimsuit? ), and although she has never had to outswim a shark, she probably could. GDPR is coming. Here’s what you should be doing. Have you received a bunch of emails about updated Privacy Policies recently? Steve Winter: conservation photojournalist, speaker, and most importantly: social media influencer.